I needed a good photo of the Soviet interplanetary rocket, the 4-stage Molniya. I decided to redo an old panoramic composite that really shows its engines in action, starting with a video of the Venera-7 launch. 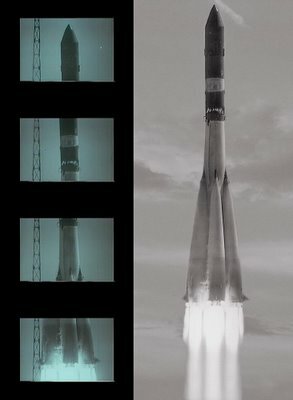 The camera was fixed to a gantry and filmed the rocket as it rose past it, so the composite is an almost orthographic view. I stripped the color out in LAB color space (doing it in RGB seems to leave block-coding artifacts behind). Then I did the composite in Panorama Factory. Normally I prefer the superior MS Digital Image Studio panorama stitcher, but for some reason it couldn’t get a lock on matching the frames, probably because of the stationary tower on the left side of the frames. I adjusted the proportions of the rocket to be accurate, comparing it to known still photos. The background was repeated of course, and not useable, so I averaged it out the and replaced it with a similar photo of a sky.